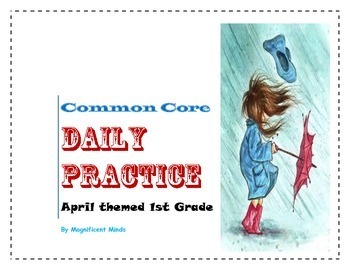 This April themed packet includes four weeks of daily practice skills. 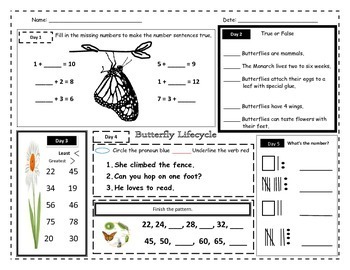 Each skill page contains a complete daily five warm-up challenge for Language Arts, Reading, Social Studies, & Math skills. Skills included for L.A: nouns, verbs, punctuation, sentence structure, contractions and pronouns. 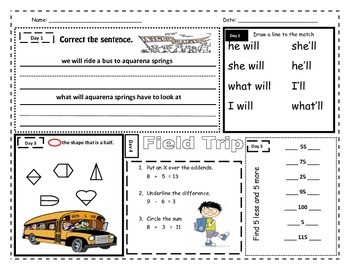 Skills for Reading: Reading instructions, answering to a True and False and determining proper sentence formation. Skills included for Math: Standard and non standard measurement, fraction, pattern counting, place value, counting money, part-part-whole, fact families, doubles, 5 more or 5 less, clock, finding addend, sum or difference. 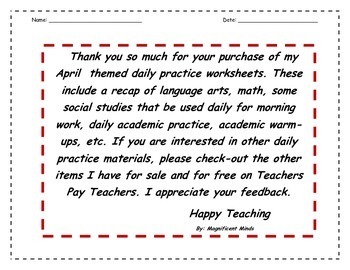 Skills for Social Studies: Life Cycle and Earth Day.